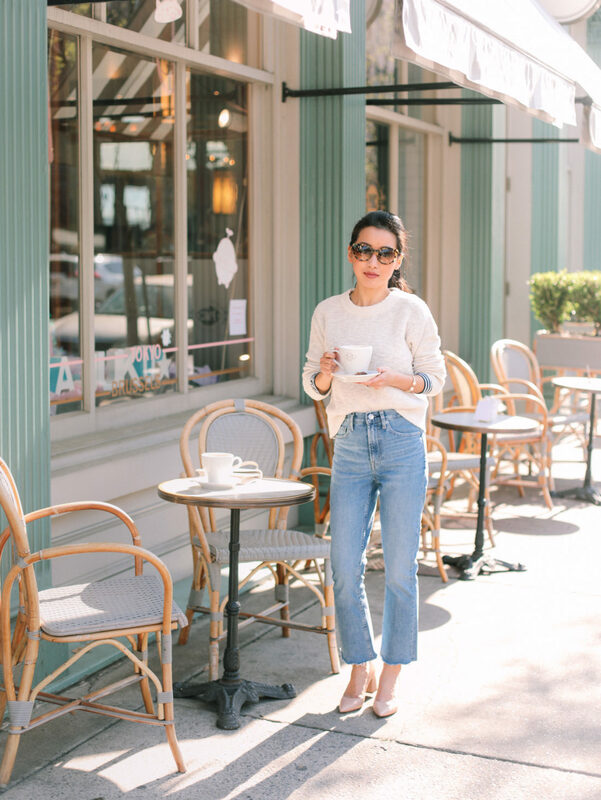 I heard great feedback after my first post with Everlane (so glad several of you loved these jeans as much as I do! ), and am excited to partner with them again to share more flattering finds. If you’re new to this brand, they make casual, often minimalist pieces with transparency surrounding pricing and factories. On each product page, you can scroll down to learn about the production costs and where the item was made. I got to try on a ton of items from their spring collection for fit, and wanted to highlight a few that make great everyday staples! I also wanted to mention again that Everlane uses a service called Happy returns, for those who prefer to return items in-person instead of by mail. Be prepared to see these jeans a lot in future outfits. They’re an awesome option if you want to venture out (but not too far out) beyond the safe world of skinny / legging jeans! The fitted, higher waist with slender legs makes these flattering even on petite ladies. The kick crop is slight, with a hint of flare at the bottom opening. 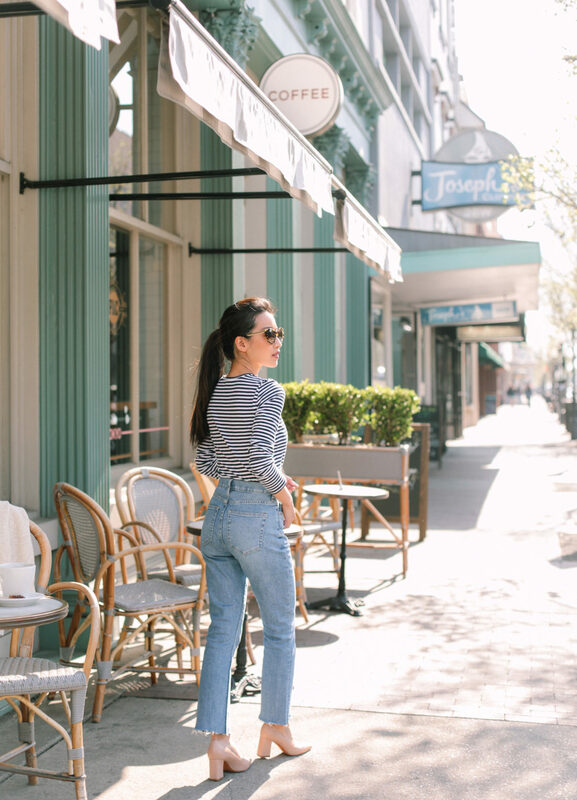 The light blue wash has a classic vintage denim feel to it with just a little stretch, and bonus: the back pocket placement plumps up my flat derrière (see pic below). Wash and dry the jeans first in case of shrinkage. 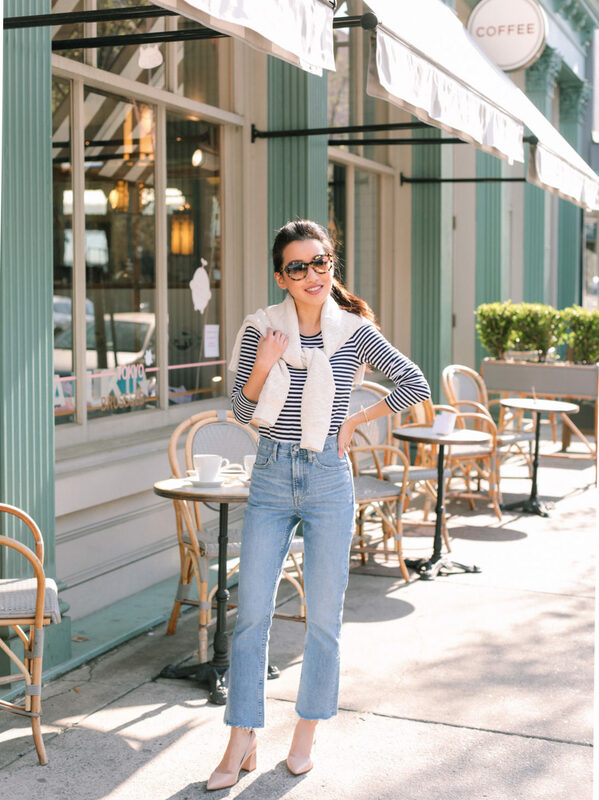 Put on the jeans and pin or mark a flattering length to shorten them to. Lay the jeans flat and cut along markings using sharp scissors. While holding the newly raw cut hem taut, use the inner blade of the scissors and scrape back and forth a bit to get the distressing process started. Wash and machine dry again to get that perfect frayed hem. OPTIONAL: If you have a sewing machine or needle, thread and thimble, I would stitch some reinforcements on the side seams right at the leg hem opening after you cut them. 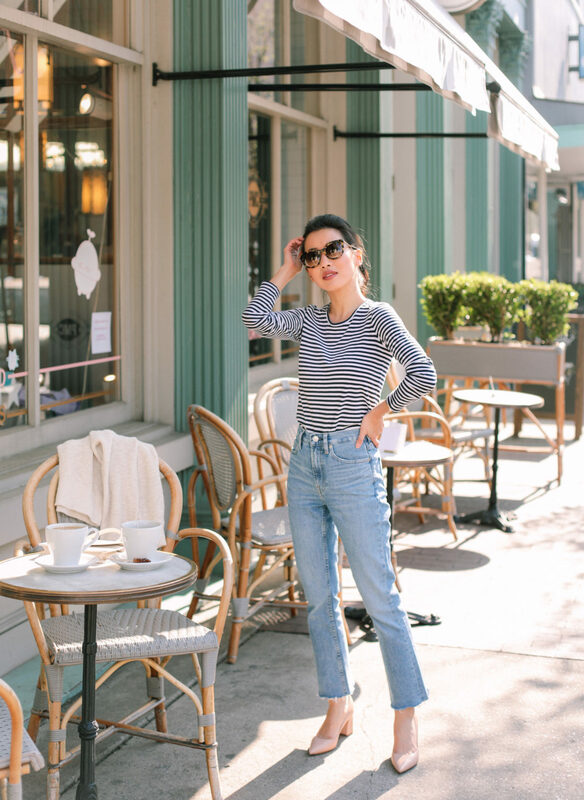 Your staple Parisian chic striped tee. This one is on the thinner, more lightweight side and good for layering. Fit is TTS, and the xxs is slim fit on me but not snug or curve hugging. Also comes in a short sleeve crewneck tee version. Also available with a V neck. I am loving the “shrunken fit” styles by Everlane since they hit just right on a smaller frame. This sweater is an oatmeal color in a medium weight, breathable, slightly looser knit. The sleeves aren’t too long on me, and the length (19.5″ long on xxs) hits at the top of my hips. I’ve layered it over a tee here, and can also picture it casually at the beach thrown over a swimsuit with denim shorts! I also tried on their cotton long sleeve crew sweater and loved the slouchy fit with slight dolman sleeves (see it on my IG stories today) – this one is a light to medium weight, tighter weave knit unlike the looser linen one. Pictured in this post. If you live in jeans and tees, you’ll love the boyfriend-style cut of this one! It has a little slouch but is still proportioned for a feminine fit, and is also slightly cropped in a petite-friendly length. XXS measures 16″ across the underarms and 19.5″ in length. Thank you to Everlane for partnering on this post. I’d love to hear any other pieces you guys love from there! I’ve gotten a few recommendations for their square toe flats and modern boyfriend jeans, but have yet to try either! Where are your shoes from?! Hi Dorothy – they are Marc Fisher. I got them here in lite latte leather, and I see a few colors on sale here. Hi Jean, I’m about the same height and weight as you, and I recently got the Modern Boyfriend jeans in light blue – highly recommend! I had to hem them to get the right ankle length, but after hemming they cuff super well and are slimming even though they’re a looser fit! Great to hear another testament for the modern boyfriend jeans! Thanks! Those pieces are super cute! Lovely outfit! Where are your sunglasses from? I definitely need a striped tee! Such a cute jean look … love ♥️ the style! In love with this striped long sleeved top <3 🙂 It's so chic! 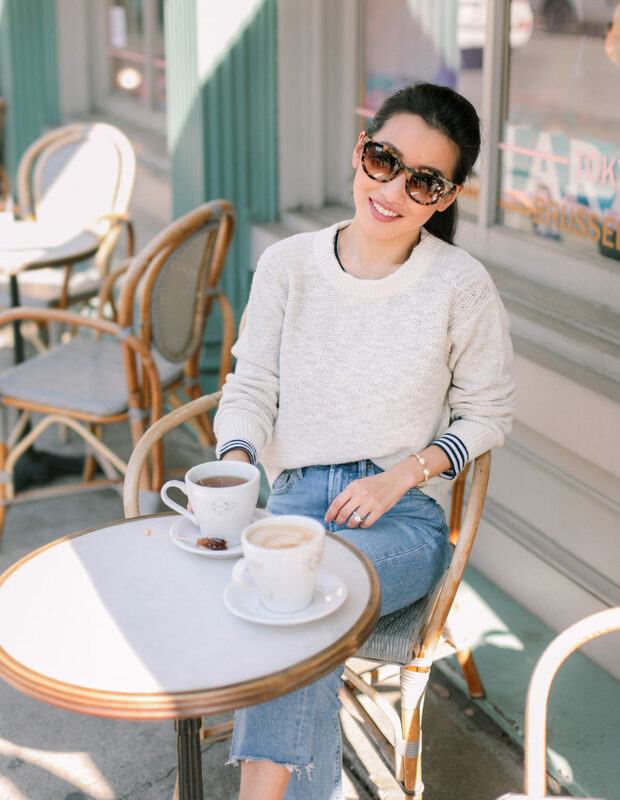 I love, love, love Everlane! They are such a strong community that is really thriving lately. I really hope that they keep getting bigger and bigger. I’m sorry, but I just can’t learn to love the new ‘kick crop’ jeans (even on Jean, who typically looks better in the seller’s clothes than the seller’s own models). So I’m disappointed to hear that these particular jeans are going to be seen a lot in future outfits. Maybe it’s just personal preference, but to me they look sloppy-loose in the waist and too short to make use of a flared look. Having said that, I’ve been admiring the Everlane sweaters and tops for some time now–especially that beautiful waffle crew-neck cashmere from last year–and have been watching their site for good sales. Anyway, very best wishes and thanks Jean for your thorough and informative posts! I wish the waffle crew would come back in more colors! It’s seriously soft and hasn’t pilled yet, which I can’t say for most sweaters regardless of price point. And I totally get this cut of denim is not everyone’s cup of tea. I personally found them to be a welcome addition to my closet full of skinnies. And for anyone shopping this style I do want to give a heads up that the waist is snug! Hi Jean. Cute outfit as usual. Would you mind to tell me where your bracelet is from? just checked out the brand and fell in love with the bracelets! The one you are wearing in this post… it is one size fits all but is it flexible to adjust size? While I’m not a fan of the kick crop (I don’t understand why we want fraying…) I absolutely love Everlane and support your partnership with them! Such a basic and beautiful outfit! Such a cute and classic outfit! Even though I can never make crop pants work for me :(( Also, I love the Everlane short trench I bought a few years ago. It fits perfectly. Not sure if it is still being sold though. Hi there! Wondering what presets you used for this set, or if you did it yourself in Lightroom. Love how even the skin tones are, even in bright sun and shade! Hi Liz! My husband edits the photos in Lightroom, however an evenly-lit skin tone has a lot to do with the angle at which you’re taking the actual photo. I always avoiding shooting with my face facing the sun for this reason. We usually shoot in full shade, or in this case, backlit with the sun directly hitting the subject’s back which allows the face to be evenly lit! The flare on these jeans is so cool. Wide-leg has lost a bit of momentum but this amount of flare is really tasteful. I’ve heard so many great things about Everlane, I’m going to have to check them out! I need to share with you and your readers a quick post. I just started following you and love some of your older posts. To get the look, I have found quite a few items on Poshmark.com . Thank you for your great taste and your classic looks. I recommend Poshmark for those who want to get “exactly” what you recommend! Short girls unite!